so far from the words of my groaning? Here's how the state handled dissent. Unflinching Stalinism: Communism in Romania ". . . the Dej leadership unleashed ruthless purges of the Bucharest, Cluj and Timisoara universities. The repression of 1956 set the stage for another wave of terror from 1958 until 1961. The targets were intellectuals who, in the late 1940s were not arrested, but had been only marginalized. This social cleansing accompanied a new offensive toward completing the process of collectivization." As a seminary student and a Hungarian, Denes was certainly aware of the 1956 events in Hungary. When Russian tanks helped crush the revolution, like other students, he became the target of the Romanian securitate (secret police). He escaped the purge of dissidents in 1956, and after graduating from the seminary, became the assistant in the castle church in Marosvasarhely (Targu Mures). He was caught in a later wave of terror and arrested. 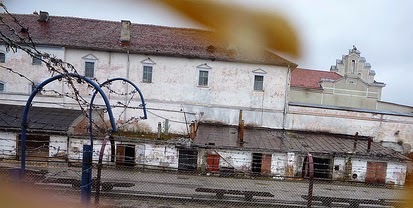 Following his arrest, Denes was flown to Kolozsvar (Cluj) and lodged in the Gherla prison where for six months he was interrogated and then beaten when he refused to reveal names or events. He soon learned that though he didn't talk, others did. Though Denes had never confessed anything, he was brought to trial because the prosecutor had produced a witness he thought was reliable. Wearing chains and shackles, Feri, the young seminary student who, under torture had talked about Denes, now in court denied it all. The judge was furious and ordered him out of the courtroom. Here’s how Fulop described the scene many years later, "In the deathly silence that fell over us, Feri turned to leave. The only sound to be heard was the clanking of his chains as he made his way down the hall." At a second trial, Denes was convicted and sent to one of the labor camps at the delta of the Danube River. "For a while, I lived on a wreck of a boat decaying in the middle of a field of bamboo located between the dike and the river. During the winter, we were herded out on to the ice to harvest this bamboo. The rusting boat was home to 400 men crowded into stacks of metal bunkbeds. The whole boat was made of thick metal, If it was warmer inside than out, water condensed and dripped down, black and dirty. The fetid smoke from smoldering wood mixed with the humid air creating filthy conditions." The cold was terrible, especially because we were very thin, and due to lack of nutrition had little strength. Many times we were so hungry that we collected leaves growing at the edges of the fields where we worked, plants we used to feed the pigs at home. We also gathered another source of food, the snails attached to our pants." One of his most terrible memories was of a Sunday morning early in the spring, a day when the milder weather had caused the ice to begin to thaw. It was not strong enough to hold the weight of the prisoners, the bamboo cutters. Like the days before, the men marched out on to the ice. It caved in under their weight and with a sickening whoosh, they fell through. Those who followed tried to stop, but with guns and dogs the guards forced them to continue into the icy water. The whole group of prisoners reacted as one with an animal shout, frightening the guards. The sergeant was a cruel man and forced the men to stay in the icy water all day long. The cold and suffering was so great that prisoners begged the guards to shoot them. I must confess that the impact of the stories grew on me, especially when we began to translate and transcribe them. At first I was immersed in the organizational and personal details of the project, keeping track of costs, of the schedule, and always aware that I was the foreigner in the group. When we began to translate and transcribe them, I began to realize that I and my generation had been deaf to stories of unspeakable horror. We justified our deafness with a selective definition of justice that did not include our Reformed brothers and sisters behind an iron curtain whose existence we barely acknowledged. Ten years ago, I helped organize a team in East Central Europe to record the stories of men and women who along with their communities survived the Communist dictatorship with their faith intact. My journey since then has taken me back into the history of the Reformed Church in Hungary. It has also given me pause to reflect on the theology that has shaped me and my own community.